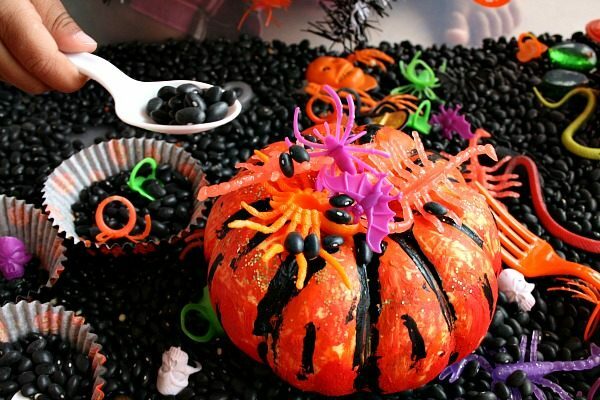 Pinterest and the blogosphere is set ablaze with Halloween crafts and Halloween activities for kids. We are no exception. 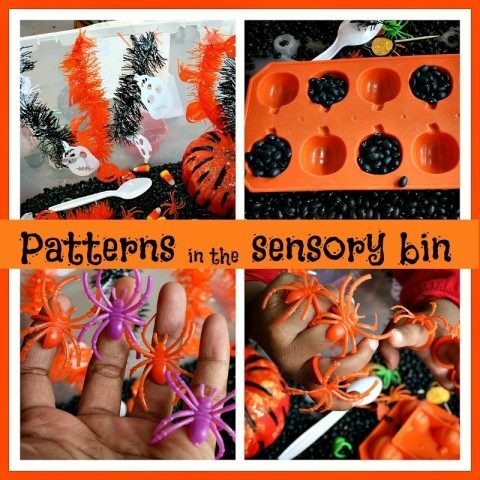 Instead of a Halloween craft, we are starting off with a Halloween sensory bin which I know will be a hit with my toddler. 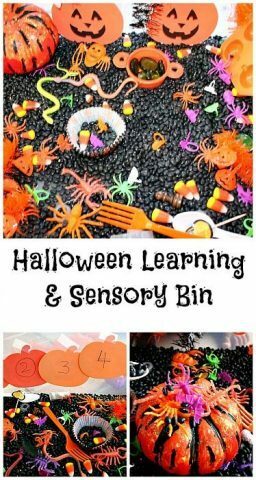 She loved our Fall sensory bin so much that I had to go back to Dollar Tree to throw together a Halloween sensory bin for her. 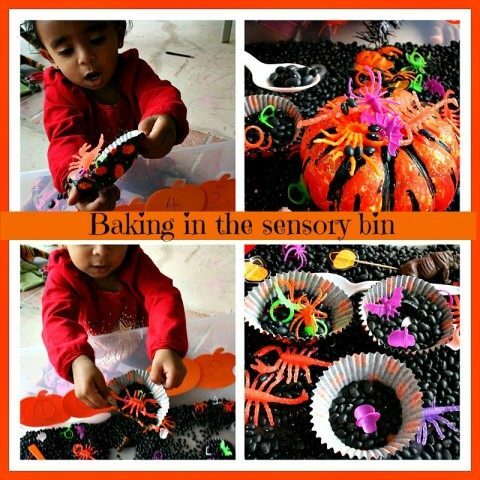 Sensory activities are great for kids who no longer mouth. 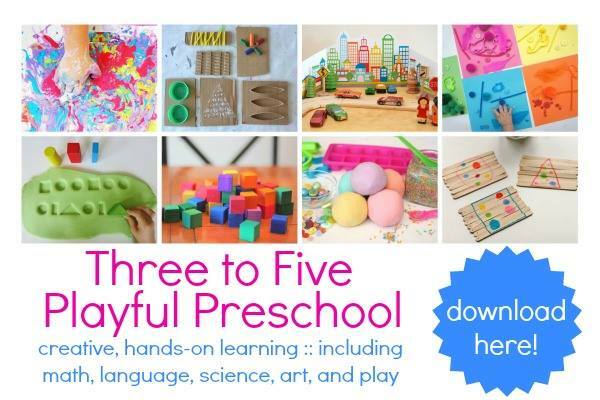 My toddler doesn’t ( for the most part) and I’m very glad to fully take advantage of all the benefits sensory activities have to offer. Simply put, they keep the child engaged and learning. 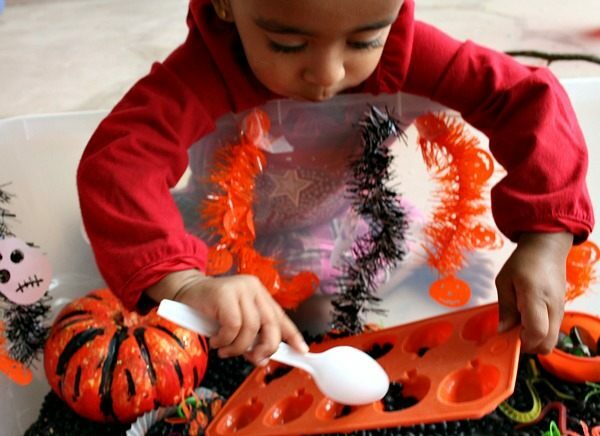 A simple sensory tub with favorite materials creates curiosity and hence the invitation to play is explored and enjoyed. 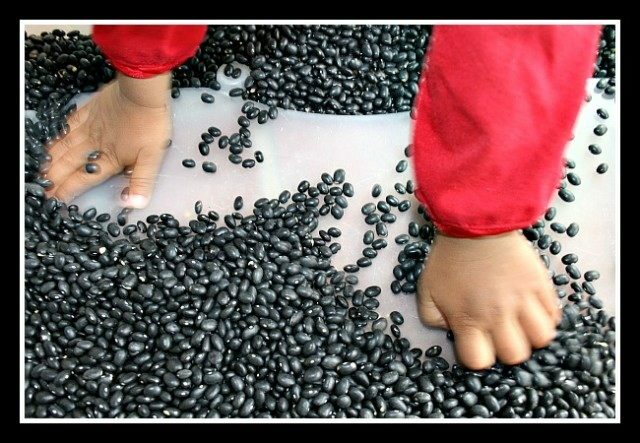 The base for sensory activities is black beans. If you are feeling brave or lucky enough to have kids who don’t like candy corn, throw in some of those for color. Since, this sensory bin is going to be a simple one, baby A and I did it together. We poured the black beans together and she played with just those for a while feeling them and pouring them between their hands. Then we added some creepy crawlies in there but didn’t stop with only spiders. We even have a stray rhino in there. After adding all the creepy crawlies, I cut out some orange and black garlands into smaller pieces and stuck them to the insides of the bin. 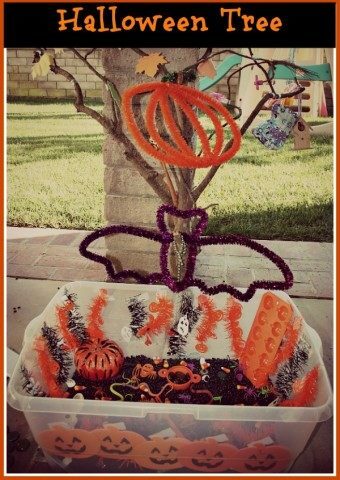 I have to add that I had my sensory bin under the Halloween Tree. Remember our Fall Tree? No ? I thought so. Click here to see what I’m talking about. That Fall tree has transformed into our Halloween Tree. How we played and learned with be the rest of the post. Baking became inevitable since we had muffin liners in there. I bunched quite a few because it had to be firm enough to hold the black beans. 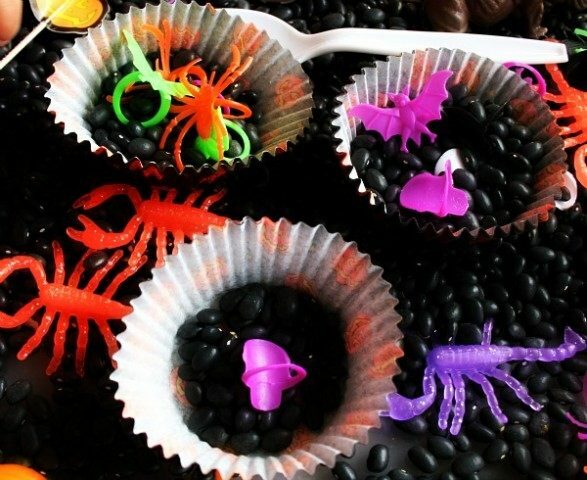 Here are some cupcakes with creature toppings..
We also made “soup” by pouring beans and creatures on top of a pumpkin. After some serious cooking, we moved on to some colors and number recognition.. Since the bin is brimming with colors, especially orange, black and purple I focused on those three colors for the day. I would hide few orange scorpions and asked her to find them. We had purple and green scorpions too. This game of “I SPY” turned out to be fun for the kid. We spent a lot of time looking for “ orange scorpions, purple bats, black spiders “ etc. For numbers, I just wrote down the numbers on foam pumpkins and stuck them to the insides of the box. First, all she wanted to do was peel of the tape from the pumpkins. She peeled off, I stuck them back while saying the number out loud Slowly that evolved into a game. Eventually she got tired of the game and she did not peel off anymore. She picked up her spoon and started simply pointing at numbers. I’d say the peel of tape game did really help us in recognizing a couple of numbers. Another learning activity we “tried” to do was simple patterns. I cut up two garlands into smaller pieces and used them to make up a simple pattern and stuck the pieces to the insides of the box. Then I repeated the patterns out loud to her while pointing at the colorful pieces. After a while she gravitated towards the creature rings. Since the plastic bugs in there were actually rings, we put on our rings in a pattern alternating orange with purple. One the rings were played with, ice trays seemed interesting for her. Since she was clearly very excited with playing with the ice trays, we scooped in beans, dumped them out. While scooping the beans in alternate slots in the ice tray, I repeated “full, empty”. Pattern Recognition : This one kind of went over her head I think. 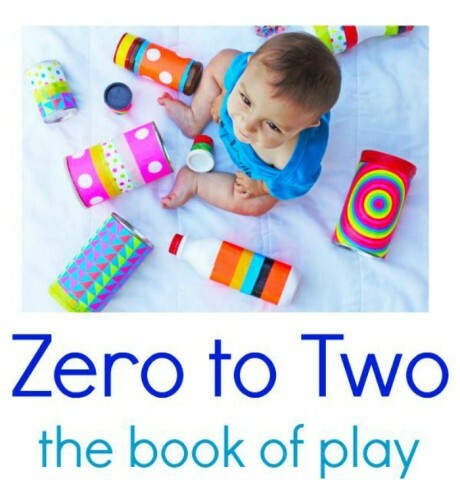 May be good for older toddlers. Oh, what fun!! Thank you for sharing at Sharing Saturday!! So much fun in a bin. Do they try to eat the candy corn? Thanks for sharing at the Boo! Linky. Oh boy did she try to eat the corn. She did..quite a lot 🙂 but I hear there are some lucky parents whose kids are not a big fan of candy corn.. This looks so much fun. 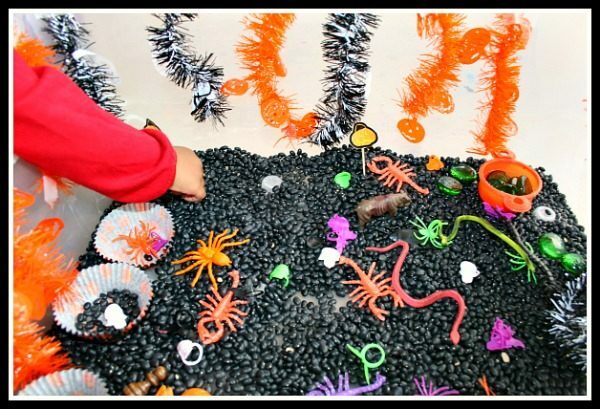 We’ve used black beans in our sensory bin this week too – although most of them have ended up on the floor. Thanks for the feature Rebecca. We had major spills too. That’s why I’m using a really deep box instead of the usual flat storage container. It looks a bit uncomfortable to me but the kid has never complained! So fun! the black beans are a great idea!!! we have a sensory bin, but it’s missing something. I think we’ll add black beans! thanks for sharing at the Sunday Showcase! 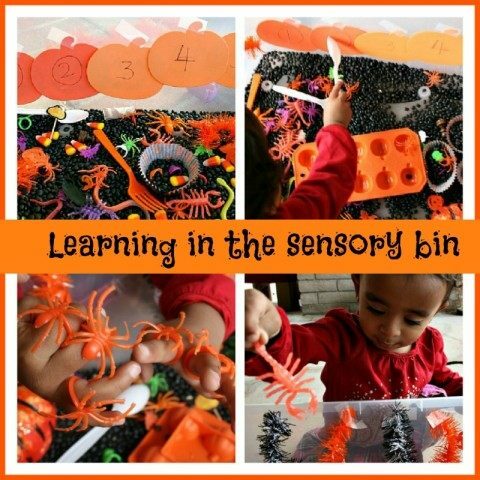 I love the different way you can have sensory bins! Thanks. We have been on a sensory bin kick lately. Toddler seems to love it!